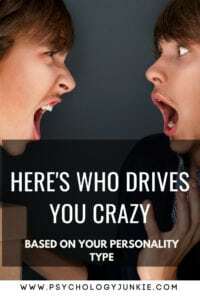 Did you know that everyone has a “type” that drives them absolutely crazy (and NOT in a good way)? We tend to have conflicts or disagreements with some types more than others, but usually we can find good things to appreciate too. What if that same type that drives you crazy is also unhealthy or immature? Well, then you have a recipe for total disaster. As you read these descriptions you might find every single type irritating. The point of this is to decipher which type would be your absolute worst enemy. “Have you heard the latest rumor?”..that seems to be the constant question of the person who drives you crazy. They are the ultimate gossip, always ready to “dish” about the latest scandal or the personal lives of the people you work with. On the surface, they appear friendly and caring, compassionate even. But what other people fail to realize is that everything they do is for praise and admiration. You can see through them, but everyone else is blind to this manipulative behavior. Their nose is always in your business, and you better not ever criticize them or they’ll spread rumors about you, too. They seek influence in big group decisions, but instead of using that influence wisely, they veer everyone towards decisions that are based on emotion and “gut feelings” rather than logic and facts. Do you remember that movie “Minions” with the obnoxious yet adorable yellow creatures? Well, it was funny in theory. But this person doesn’t seem to realize that minions are cute, fictional creatures that only belong in movies. They’re trying to turn everyone they meet, including you, into their own personal errand-runner. Their hunger for authority knows no bounds, and if they can’t be the one in charge they tend to act like they are anyway. They may even go so far as to undermine the real authorities. They’re extremely argumentative, and find a way to turn any conversation into a debate. They have grandiose, unrealistic ideas about the future but don’t seem to pay any attention to the facts and what needs to be done right now. If you try to have a personal conversation with them they act bored unless it has something to do with their work, their goals, or their ambitions. Unhinged would be a nice way of describing the person who drives you crazy. They are completely absorbed in ideas and patterns that are completely unrealistic and impractical. Their single-minded devotion to their “vision” seems totally misplaced and even hazardous to the real work that needs to get done. They complain about work, responsibilities, and chores because it gets in the way of their daydreaming. You wonder if they’re on drugs because they get a constant glazed-over, detached expression on their face regularly. When you ask them about it, they just say you’re not “evolved” enough to understand their theories. When they’re offended (which they are regularly), they never just “say it like it is”. They waste your time beating around the bush, and when they do finally confront you their language is so metaphorical and pretentious you don’t even know what their point was. They are easily hurt, even by the most constructive criticism, and read into everything, making minor issues way more complicated than they need to be. “Unlimited Ways To Feel Superior” should be a book that this person has on their coffee table. They might be intellectual, but they don’t have any real-world application for their knowledge. As far as you’re concerned, the only good they get out of it is making themselves feel better than everyone else. They don’t seem to care about what anyone needs or how anyone is feeling. They blurt out “honest” truths that are so patronizing they make your skin crawl. Sure, being honest is good, but one should never underestimate the value of tactfulness and empathy. This person is all about logic and strategy and basically dismissed anything you had to say once you showed you actually had feelings. They don’t like to do things by the book, in fact they keep changing things to a newer, “better” system when the older system was working just fine. “My sensitivity is a strength!”, that seems to be the motto of the person who drives you crazy. And it really can be a strength, but I mean…crying over a cracked nail? Aren’t there more important things to be sensitive about? Really, it’s amazing they haven’t cracked more than that with their obliviousness to the environment. When you’re trying to get a project done they come up with all these new “different and better” ways you could do things. When you try to explain your method, they interrupt or talk over you constantly. If you do try to befriend them (hey…you like challenges) then they become clingy and overly dependent. No, sorry you can’t hang out. You have plans. Forever. “I speak sarcasm fluently”. Those are the words emblazoned across the t-shirt of your enemy. And the most irritating thing about it is that you actually appreciate sarcasm….or you thought you did until this person came along. They get a thrill out of “trolling” people and using their weaknesses and quirks as fodder for mocking and cruel jokes. Everything about them reeks of insincerity and manipulation. They know how to turn on the charm to get what they want, but as soon as they’ve got it they revert back to their normal snarky, belittling behavior. Sure, they might have some intellectual ideas, but their ideas really have no place in reality. They are frequently lost in a series of future ideas that will never see the light of day. You think they’re unrealistic, they think you’re too constrained by reality. The social justice warrior gone bad…that’s the kind of person who gets on your nerves. They believe that they are the only ones who really care about the dolphins/environment/people. And that’d be fine, if they were actually doing something about it. But all they seem to do is write self-righteous rants on Facebook and Twitter. They are so resentful and easily offended that you have to walk on eggshells around them on a constant basis. They go from being isolative and wrapped up in their own problems to critically tearing down other people and trying to impose guilt trips on them. Moral-superiority is the name of the game, and they win it. Every. Day. Fun = shallow to your adversary. Of course, they don’t just say “you’re being shallow” they merely imply it by making regular patronizing comments. Coming right out and just saying what they mean is too simplistic, so instead they beat around the bush, taking forever to get to the point. If they are in any kind of leadership position, they micro-manage everything you do. They seem to take forever to solve the most basic, simplistic problems because they spend more time theorizing about the problems than actually dealing with them. If you ever do try to befriend them, they take it too far and may even think you’re flirting with them when you’re simply trying to be nice. This will usually put the nail in the metaphorical coffin and you’ll be done trying to get along. I know as an INTJ you just love sharing every detail of your personal life, right? Wrong. But your antagonist can’t seem to figure this out. They want to know all about you, every nitty-gritty detail. They seem warm and friendly on the outside. But what others fail to realize, and what you are so acutely aware of, is that everything they do is for validation and admiration. When they don’t get that, they become “martyrs” and masters of passive-aggression and cruel gossip. If you ever try to give them any kind of constructive criticism they react so dramatically and with so much misplaced sensitivity that you instantly regret it. To get back at you for criticizing them, they will find some weakness of yours, particularly one they see as a “moral shortcoming” and criticize you in an effort to make themselves feel better or superior to you. You’ve reverted to giving them the “INTJ Death Stare” whenever they try to talk to you. As an INFJ you’re a very independent person, but this individual doesn’t seem to know that. They have a ceaseless hunger for authority, especially over your decisions. They pride themselves on “telling it like it is”, but this only succeeds in making the look superior and unabashedly tactless. This problem is only compounded by the fact that they jump to conclusions so quickly that their judgments are one-dimensional and poorly thought out. If they’d only look at people with more depth and perspective and actually listen they’d realize that 90% of their “advice” is completely useless and condescending. They discount your insights as “irrational”, patronize you for your emotions, and ignore the fact that you probably have the insight into their psychology to tear them to pieces…but you’re too nice to do that…or are you? The person who drives you mad has a self-righteous persona and a tendency to spread rumors and gossip about people they dislike. They slow down your plans by calling them out as “unrealistic”, and if they are in any kind of leadership over you, they bog you down with detail-work and micro-manage your projects. You’ve got an innovative, original idea? Sorry, you’re not thinking small enough for them. They laugh at you and say your idea is too “out there”. When you inevitably lose your cool with them, they fall apart and become hyper-emotional and passive-aggressive. Their life seems to be a series of overly-dramatic outbursts and rambling gossip sessions. Ever been around someone who is skeptical of all your dreams? Someone who seems bent on calling attention to nitty-gritty detail flaws in your work? That’s the kind of person who drives you crazy. This individual sees your passion and affecting nature as fundamentally flawed. They live to “bring you down to earth” and seem to pride themselves on pointing out crippling truths and criticisms about the people you care about. When you tell them they could be more tactful, they just tell you about the merits of honesty and patronizingly chide you for being too “soft-hearted”. They believe everyone should do things “by the books” and they limit your ability to envision the future by calling out your ideas as unrealistic and your predictions as “baseless guess work”. Like personal space? The person you can’t stand seems to have no respect for that. Their hyper-active, attention-seeking ways are like a megaphone intermittently blasting in your brain. Before you met them you couldn’t think of anything worse than spending a whole weekend watching “The Bachelorette”, but now that they share an office with you, you’ve realized there is something worse….hearing them describe every single detail about every single episode of “The Bachelorette”. If you have to work as a team they are constantly distracted. They think your ideas are too unrealistic and complicated, and when you try to explain them, they get a blank, clueless look and then say something like “that’s cute, now say that again in English?”. “Look at me! Look at me!” That’s the motto of the person you can’t stand. Everything they do seems to be for attention, to make an impact, or to “shock” others. They are the ultimate car salesmen – manipulative, abrasive, and opportunistic. They don’t seem to think about the impact of anything they do or its consequences on others. Life is about thrills, getting ahead, and it doesn’t matter who they have to hurt to get there. If you ever try to confront them about their actions, they have a way of rationalizing everything they do. They conform logic to their own ends and desires, even when their justifications aren’t logical at all. They tend to play the role of “entertainer”, and while the popular people might laugh at their jokes, you can’t help but be disgusted. Most of their “entertaining” involves making fun of other people’s insecurities and quirks. Anytime they embarrass someone you can visibly see them get a rush from it, and it only encourages them to become more mocking and persistent. Do you hear that cracking sound? That’s the sound of the eggshells you’re walking on around this person. You’ve hurt their feelings just by breathing, and you can hardly see them because the morally-righteous pedestal they’ve scaled is beyond your line of vision. When you try to argue anything with them, they insist that their emotions and values are just as valid as your logical arguments. They mock your ideas for being too “unrealistic” and, if you have the bad luck to work under them, they micro-manage all your projects, making sure that nothing is too unusual or strays too much from the “tried and true” method. Do you like to read? Well, that’s good, because you’re going to be doing everything “by the book” from now on. The person who drives you mad finds something wrong with all your ideas, usually because they’re not traditional enough. Worse yet, they micro-manage every project you undertake and correct everything that isn’t “standard”. The minute you start brainstorming, they’re there, calling attention to minor detail-related flaws in your ideas. You tell them you’ll work out the details later, but that’s not good enough for them. They’ve already written you off as being too “scatterbrained” and impractical. You try to be accepting of people, you really do, but even when you try to be nice to this person they just assume you’re flirting with them. They pride themselves on “bringing you down to earth” but what they don’t realize is that they’re draining all the creativity and imagination from your life. Do you agree with this article or have any experiences you’d like to share? Let us know in the comments! I just had to share this with the INTP in my life, because that was pretty spot on. But I think it’s more those loudmouths who voice strong but not well thought out opinions that they “heard somewhere so it must be true” that REALLY get my INTP’s goat. Rationals can’t stand mental laziness.